The World Health Organization reports that around three billion people cook and heat their homes with an open fire that burns biomass such as wood and coal. That’s HALF of all people in the world! Nearly two million people die prematurely from illness attributable to indoor air pollution from household solid fuel use. Eighty five percent of those people who die are women and children. Those are staggering numbers! How many of us in the developed world knew about this? I mean the last time I lit a wood fire was on a recreational camping trip. Not to eat my next meal. You may wonder why so many people burn wood, coal, or dung for heating and cooking. Simply it’s because these are often the only resources available and affordable. People use what they have to survive. Oftentimes they go to great lengths, like walking many miles, to get fuel such as wood. Fortunately there are clean stoves that can greatly reduce the poisons that are emitted when heating and cooking with biomass. These stoves are based on the Rocket Stove. It’s design helps combust all the material that are being burned. That way it doesn’t end up in the air. One example is the StoveTec Stove developed by the Aprovecho Research Center. They have models that burn wood, coal, and pasteurize water. They range in costs from approximately $90 to $115 USD. But you can buy one for someone in need for only $15. For some of us in the US these stoves could be a great alternative to the gas grill you have out back. Do your part in reducing the demand for natural gas in the US. Use waste wood instead and put the remaining charcoal in your soil for the garden. Plus you can put fewer greenhouse gasses into the atmosphere and help slow global warming. I’m going to get one for someone who really needs a clean stove and try it out myself too. Join me! This is cross posted from Chapelboro.com. Thanks to them for allowing me to post it here. 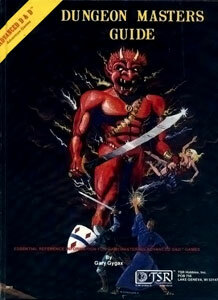 I was reading the Wikipedia page of David C. Sutherland III and discovered he illustrated the first edition rules of the Advanced Dungeons & Dragons Dungeon Master’s Guide. (Seen to the left.) Very cool to find a peice of the puzzle that is the history of creative work done for early RPG. This is one of the books I owned. Long gone. Really wish the original was still around. Ah childhood nostalgia!